Papua New Guinea, a country in Oceania occupying the eastern half of the Island of New Guinea located in the Southwestern Pacific Ocean in an area referred to as Melanesia has a total land area of 178,703 square miles and a population of over 6.7 million. Papua New Guinea is an explorer’s dream – both culturally and geographically. It is a very populous country with highlands, lowlands, wetlands, mountains and rainforests and its inhabitants are very interested in preserving their culture and tradition. Those honed in hunting, farming, and fishing is highly respected. Agriculture is the main sector of its economy. Oil, copper, gold, coffee, cocoa, oil palm and tea are the other segments. A significant population lives in extreme poverty and are illiterate. Weather-wise the best time to visit PNG is June through September which is also when most of the festivals take place. Its rich and yet to be discovered life species has always placed it in the radar of scientists. For safety reasons, visitors are encouraged to explore the country with a tour operator. Visitors are also drawn by its cultural diversity. Colorful local rituals such as dancing, singing, and ornamentation are enacted at their musical festivals. Visitors also appreciate partaking in their market fairs. The main activities are diving (New Britain, Madang, Kavieng), surfing (Bougainville, New Britain), hiking, trekking and bird watching. Kokoda Track and Mount Wilhelm are popular trails. Lonely Planet Papua New Guinea and Solomon Islands 978-1741045802 $22 The updated edition has very good information for traveler’s to PNG covering almost 250 pages. Papua New Guinea Map by ITMB 978-1553413615 $9 1:2,000,000 Scale. The first stamps of Papua New Guinea were a set of seven stamps released on July 1, 1901 showing Lakatoi – multi-hulled canoe popular among the natives New Guinea – the multi-hull design helps with stability in rough waters. The set (Scott #1 to #8) catalogs for around $800 mint and around the same for used. The area of the Eastern portion of the Island of New Guinea became a British Protectorate in 1884 called “British New Guinea”. The first set has this inscription. The name was changed to Territory of Papua in 1906 after the transfer of ther territory administration to Australia. A couple of sets (Scott #11 to #18 and #19 to #26) issued in 1906 and 1907 were ‘Papua’ overprints on the first set. These sets are also very valuable cataloging for around $500 and around $200 respectively. Lakatoi issues along with overprints and surcharges were the primary stamp issues of Papua New Guinea during the period till 1932. Many of those sets are valuable cataloging upwards of $100. Papua released a long set of sixteen stamps on November 14, 1932 showing local scenes. The set (Scott #94 to #109) catalogs for around $500 mint or used. The designs show Motuan girl, bird of paradise and boar’s tusk, mother and child, Papuan motherhood, ceremonial platform, fire maker, Steve, son of Oala, tree houses, Papuan dandy, masked dancer, shooting fish, Lakatoi, Delta Art, pottery making, Sgt. Major Simoi, and Delta House. A set of fifteen stamps released on October 30, 1952 showing local scenes. The set (Scott #122 to #136) catalogs for around $160 MNH and around $35 Used. The designs show tree climbing kangaroo, Buka head-dress, youth, bird of paradise, policeman, Chimbu Headdress, Kiriwina Chief’s House, Kiriwina Yam House, copra making, trading canoe, rubber tapping, shields and spears, plumed shepherd, map, and spearing fish. The administration of Papua and New Guinea was unified in 1949 and this was the first set with the inscription ‘Papua & New Guinea’. A set of eleven stamps issued between 1964 and 1965 in the Birds theme. The set (Scott #188 to #197) catalogs for around $25 MNH and around half that for Used. The designs show striped gardener bower birds, New Guinea regent bower birds, blue birds of paradise, lawes six-wired birds of paradise, sickle-billed birds of paradise, Emperor birds of paradise, brown sickle-billed bird of paradise, lesser bird of paradise, magnificent bird of paradise, twelve-wired bird of paradise, and magnificent rifle birds. The name of the country was changed to Papua New Guinea and from that point on the inscription in the stamps read ‘Papua New Guinea’ instead of ‘Papua & New Guinea’. A set of ten stamps released between 1994 and 1995 in the Artifacts theme. The set (Scott #825 to #840) catalogs for around $30 MNH or used. The designs show Hagen Ceremonial Axe of Western Highlands, Telefomin War Shield of West Sepik, Head Mask of Gulf of Papua, Kanganaman Stool of East Sepik, Trobriant Lime Gourd of Milne Bay, Yuat River Flute Stopper of East Sepik, Tami Island Dish of Morobe, Kundu Durm of Ramu River Estuary, Gogodala Dance Mask of Western Province, and Malanggan Mask of New Ireland. A set of four stamps released on November 20, 2002 to mark the International Year of Mountains. The set (Scott #1049 to #1052) catalogs for around $5 MNH or used. The designs show Mount Wilhelm of Papua New Guinea, Matterhorn of Switzerland, Mount Fuji of Japan, and Massif des Aravis of France. Papua New Guinea’s terrain is mountainous, with New Guinea Highlands running the length of the Island. Some areas are extremely rugged and that makes it difficult to develop transportation infrastructure. Mount Wilhelm featured in this set is the highest point in New Guinea at 4509 meters. The first coins of Papua New Guinea were Commonwealth Standard Coinage (100 Toea = 1 Kina) Bronze Toeas issued in 1975 showing National Emblem in Obverse and Butterfly and Value in Reverse. The issue is common and catalogs for less than a dollar in UNC. The first gold coin was issued the same year – a 100 Kina 0.2769 troy ounce gold coin showing a portrait of Prime Minister Michael Somare and Date in Obverse and Bird of Paradise and Denomination in Reverse. Papua New Guinea has released a number of commemorative gold coins over the years. Coins $3 and up Common UNC Toeas start around $3. Early Kina Proofs from the 1970s, Proof Sets, etc start around $30. Specimen Sets, Gold Coins, Gold Silver Bird of Paradise Presentation Sets, etc go into the 100s. Paper Money $3 and up Common UNC Banknotes starts around $3. UNC Polymer Sets start around $15. Consecutive UNC Banknotes 10-pieces or more, High Value Polymer Sets, etc start around $50. Rare Specimen UNC Notes, Bundles, etc go well into the 100s. String bags (bilums), masks, storyboards, bowls, baskets, trays, drums, etc., are a few of the souvenirs from the PNG. Antiques $25 and up 19th century original antique masks start around $25. Ramu Spirit Figures, 18th century maps, Maprik Wosera Coconut Shell Yam Spoons, etc start around $50. Cowrie Clay Turtle Shell Sepik masks, Decorated Bone Digging Tools, Daggers, Tomahawks etc start around $100. Art $10 and up 19th century photographs and prints showing personnel start around $10. Miscellaneous Collectibles $3 and up Postcards, Magnets, Badges, etc start around $3. Tiki Masks art prints start around $20. Authentic Shell Necklaces start around $50. 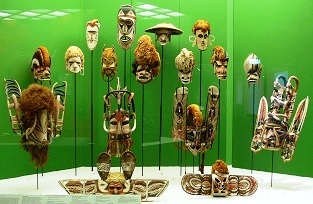 Carved Faces Walking Sticks, Bailer Shell Chest Ornament, Carved Ancestor Figures, Sepik River Masks etc start in the 100s and go well into the 1000s.